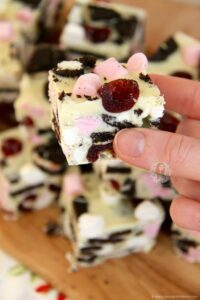 A Chocolatey and Delicious, No-Bake Oreo Rocky Road treat full to the brim with Chocolate, Oreos, Marshmallows and more! Quick, easy & heavenly. 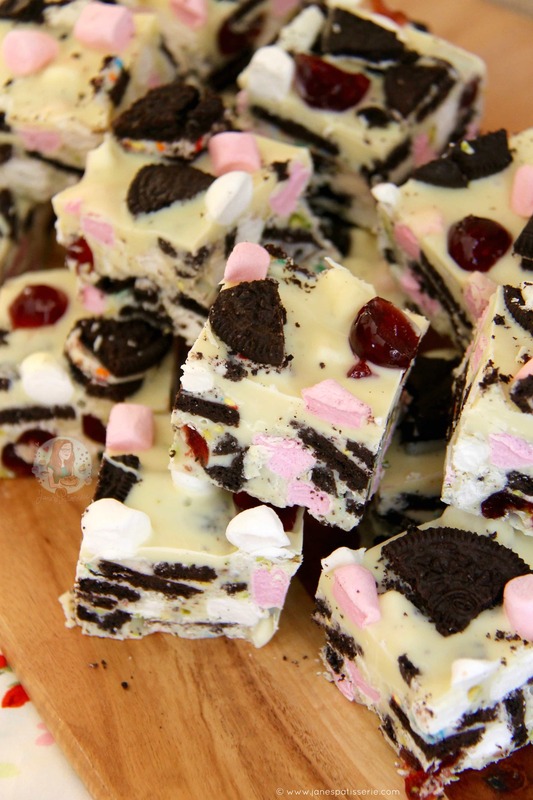 I adore Rocky Road. 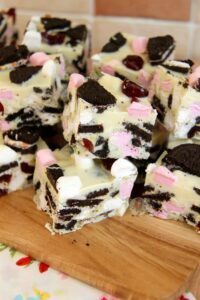 This is obvious, I have quite a few Rocky Road based recipes now on my blog, and I just want to make more… However, this really had to happen. Like, I wish it had happened sooner. 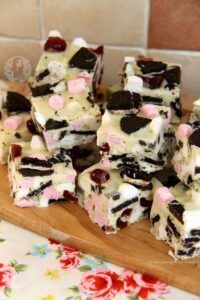 I have made so many recipes to do with Rocky Road because I love the combination of treats in it. What can be better than chocolate, biscuits, marshmallows, and even more delicious goodness? It’s my idea of heaven. Switch up the biscuits to Oreos and its a whole new level of yum. I’ve made a few versions of this recipe, and decided the White Chocolate worked best. 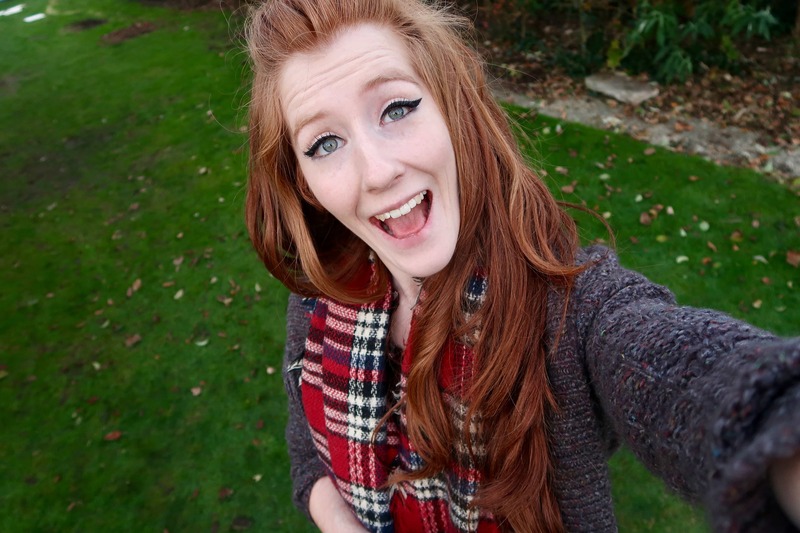 Not only can you actually see the Oreos more (it looks far nicer!) but I like the flavour combination of it. It’s also nicer to have a different base compared to my other recipes such as my Rocky Road, and Easter Rocky Road. I obviously used Mini Marshmallows as well in the recipe, but thought the Glace Cherries and Pistachios made a seriously yummy addition. Obviously, if you don’t like nuts or are in fact allergic, they are not essential – but these sort of recipes end up just being what you like. 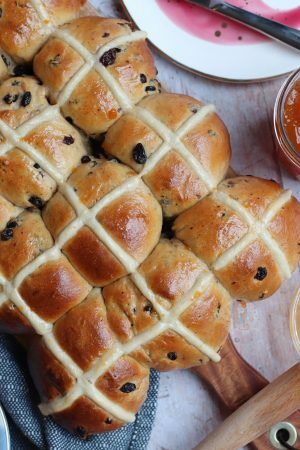 This little treat has proven very popular with all of my taste testers, so much so that I have made it several times already even though I have been meaning to make new recipes! I really hope you like this recipe as much as I do. It’s simple, easy, quick and so adaptable that everyone will enjoy it. 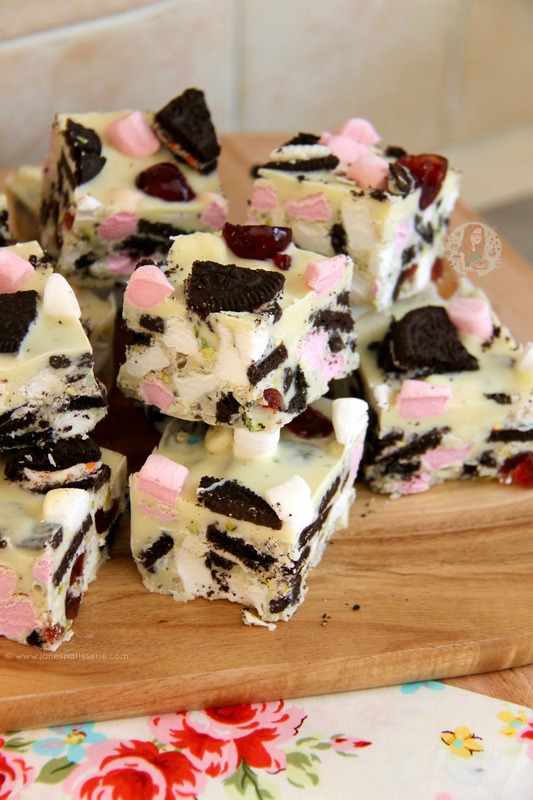 This recipe makes 16 pieces of Rocky Road! 1) Line a 8/9″ Square tin with Parchment paper and leave to the side. 2) In a Large bowl, add in the Chocolate – melt on a low heat over a Double Boiler, or in the Microwave on short bursts until fully melted – stir till smooth! 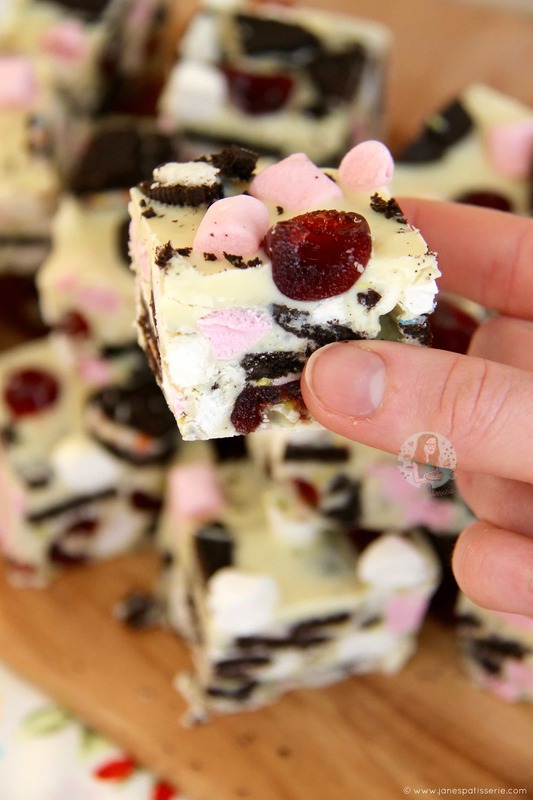 3) Once its melted, add in the Marshmallows, chopped Oreos, Cherries and Pistachios (hold back a handful of each for the topping though) – fold together – pour into the tin and spread till its even. Push onto the top some of the Oreos, Marshmallows, Cherries and Pistachios! 4) Refrigerate until set, chop up, and enjoy! 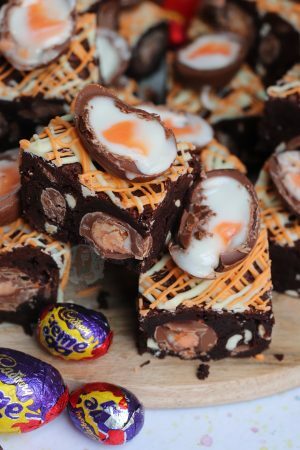 If you would like to make this with Milk or Dark Chocolate, you can add in 100g of Butter and 100g of Golden Syrup when you are melting the chocolate and it’ll make it delicious. However, I find this can be a little risky (it can split/curdle easily) and too sweet for the White Chocolate so I leave it as just Chocolate when using White! I used a mix of regular Oreos and Birthday Cake Flavour Oreos in this, along with the pistachios, cherries and mini marshmallows. All of the filling types are optional, but I adore this combination with the Oreos! 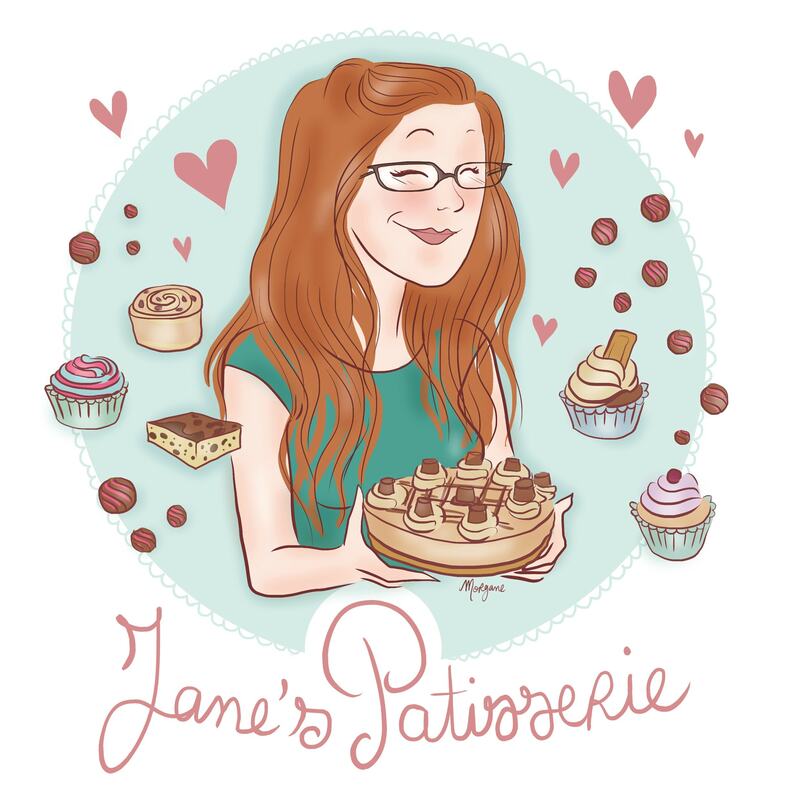 Find my other Traybake & No-Bake Recipes on my Recipes Page! 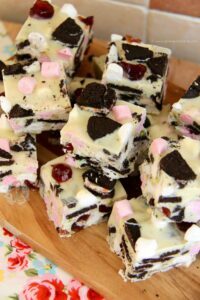 Older Next post: Rocky Road Fudge! Newer Previous post: Honeycomb Crunchie Cupcakes! Looks lovely 🙂 if I was to take out the cherries & nuts would I have to add more of something else? You don’t have to, but you can add more marshmallows or oreos if you wanted! These look delicious but sadly I’m not a fan of cherries and allergic to nuts. 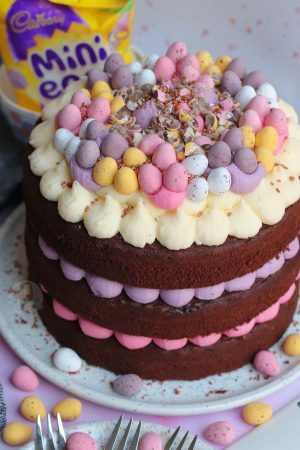 would mini eggs be a good Easter substitute ? Yeah you can literally swap it to whatever you fancy instead! These look delicious! Love your recipes, especially the no-bake desserts… perfect for those of us students who live in uni dorms! Thank you! Haha yes!! Some of my friends at Uni love making my No-Bake desserts as they dare not go near the oven! Hehe thank you!